50 f/1.8 is my "85mm equivalent lens". I'd hope to say it's my portrait lens but performance wide open and bad bokeh limit the usage of this lens pretty much. I mainly use this lens stopped down to photograph details in architecture and landscapes. This is my least used lens. 50 f/1.8 is quite sharp lens if stopped down to 2.5 or more. But colors and contrast are not on on same level as in L-lenses. Wide open sharpness is horrible and there is quite much CA (chromatic aberration). Bokeh is really annoying and therefore I prefer to shoot "everything in focus" pictures with 50 f/1.8. Build quality is a joke compared to other Canon lenses I have. Lens is full plastic, even the lens mount is plastic. Lens barrel extends from lens and if hood is used, it attaches to the filter threads. I don't use hood for this lens since it will not protect the lens at all, since it's most vulnerable part is the extending lens construction, and by using hood the torque/impact only gets bigger when hitting lens somewhere. Front lens element is deeply recessed into the lens barrel and therefore hood is not needed for flare prevention neither to protect lens from scratches. If using filter then hood is needed to prevent flare since filter threads are about 2cm in front of the front lens element. If manual focusing is needed lens has to be first turned to manual focusing. The AF/MF switch requires quite much power to change from AF to MF or vice versa, this is good (no un-intentended changes) and bad (difficult to change when photographing). This lens has no focus scale neither depth of field marks. 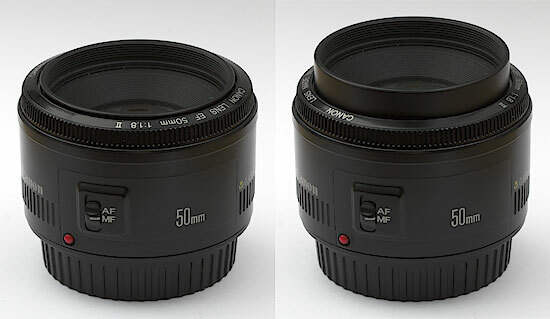 50 f/1.8 has 6 lenses in 5 groups. No special lens elements used in this lens. Lens weight 130g. Dimensions without hood, with lens caps 58mm x 68mm. Minimum focus distance is 45cm. There are 5 aperture blades and aperture doesn't seem to be circular, except wide open. Filter size is 52mm. Autofocus is "Overall linear extension system with Micromotor" according to Canon. This is the cheapest AF-motor system, and it is quite fast but makes annoying sounds and isn't very precise. Unlike my other lenses 50 f/1.8 is not internal focusing and due to that the lens extends a little bit when focusing close.